Cheap Car Insurance in NJ | 20 down payment car insurance now! Are you a good driver with a great driving record in New Jersey? 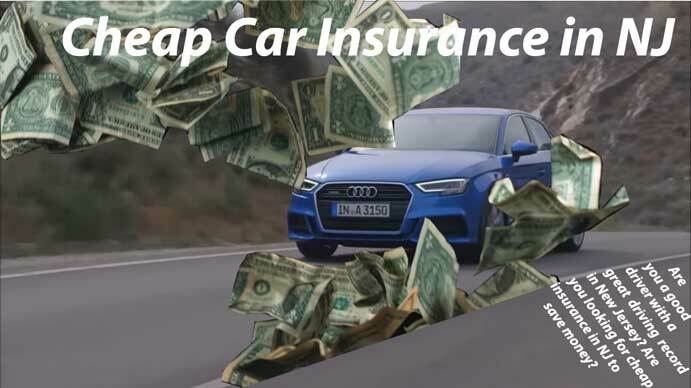 Are you looking for cheap car insurance in NJ to save money? Fortunately, there are options for save drivers and even higher risk motorist that has a history of speeding tickets, DUI or other citations. In the garden state, drivers without any speeding tickets on their record can save up to 24%. That amounts to 17% better savings than the national average. Not only can you get better car insurance for driving without any incidents, but you also can qualify for safe driver discounts. If you are smart, you can save between 5% and 10% on your premiums with this discount. New Jersey is a no-fault state. This means that all licensed drivers are required to carry auto insurance. The minimum legal coverage includes liability insurance, personal insurance protection (PIP) and under-insured motorist protection. This protection covers you for medical expenses, in the event of an accident, regardless of who was at fault. For a nice car, you need a high coverage; visit goodtogoinsurance. The most affordable insurance policy that meets all laws in the state of New Jersey you can find with us. We’ll also get you the discounts you deserve. If you are in the younger driver bracket (ages 16 to 25), you will be charged more for your automobile insurance in NJ. This is because most insurance companies see you as a higher risk factor than older adults with more driving experience. Teens pay up to three times the national average for their premiums. Drivers under 25 can expect to pay around $4700 a year for coverage in New Jersey. The best way for teens to get cheaper rates is to drive a basic car and get on their parent’s policy. It also helps to complete a certified defensive driving class. Completing this class can save teens another 5% or more off their premium. If you’re looking to get the cheapest NJ auto insurance, you need to have a great driving record. You can reduce the amount you are expected to pay by avoiding at-fault accidents and speeding tickets. Do not get a DUI on your record. You will be automatically charged more for insurance, assuming you even get to keep your license. Also, try to avoid these reckless driving citations. This state tends to punish drivers more severely than most for these nicks on their record. Your insurance rates could go up by well over 20% when your record has more than one infraction. After comparing quotes across fifty different companies in New Jersey, we were able to find the insurers who have the best rates. We compared quotes for four different driver brackets. Included are single young men, single middle-aged men, married middle-aged men and married senior couples. Across these companies, the average yearly premium came out to under $1400, which is 37% less than the other carriers in the state. Farmer has some of the best deals. A married man, between 40 and 65 can get annual coverage for about $1,180. A local insurer, Plymouth Rock, also has low-cost coverage that beats many of the national providers. Personal injury protection is a requirement in the state of New Jersey. This is the type of protection that will help you pay for your medical bills if you have an accident, no matter who was at fault. Full PIP coverage includes extra features such as funeral expenses and income continuation assistance. If you suffered an accident-related injury that renders you unable to perform housework, you can get assistance for that as well. Full PIP health primary is an upgrade from standard PIP. It grants payments on top of the health insurance coverage amounts. You can opt for medical PIP. It’s much cheaper but does not include the extra features like funeral expenses and death benefits. It can still be very beneficial when it comes to paying costly hospital bills. With the standard level of New Jersey no-fault car insurance policy, you can choose whether or not you want to sue for damages if the accident that was not caused by you. Limited right to sue – You are only able to sue if the injury suffered is extreme, matching the criteria set by the state. This typically includes death, disfigurement, or loss of limbs. Unlimited right to sue – You have the ability to sue the at-fault driver no matter how big or small your injury is. The more expensive option to add on to your car insurance is the one we mentioned before. However, it will grant you more suing freedoms. We can help you find the most affordable car insurance in the Garden State, so you can legally drive for less. But before you buy any coverage, it’s important you familiarize yourself with New Jersey’s car insurance laws. All of the state insurance laws are set forth by the NJ Motor Vehicle Commission. They require all drivers to have proof of liability insurance when registering their vehicle. Any vehicle owners in the state of New Jersey with cars registered to their name must always be able to certify that they are carrying valid insurance. In the state of New Jersey, drivers with a blood alcohol concentration of 0.08 or more will be considered driving under the influence. Drivers are also prohibited from driving under the influence of any controlled substances, which include cocaine, marijuana, or any kind of inhalant. First offenders with a DUI conviction will face up to 30 days in jail. They might also face fines of up to $1,000 and a license suspension that lasts between 3 and 12 months. If you are ordered to have urine and blood tests for example, and you refuse to do it, you will have your license suspended for 7 months. It is illegal to use cell phones while driving in the Garden State. There’s also a ban on texting while driving. You better don’t violate the low, you can be fined for up to $400 for the first offense. The penalties become harsher after the first violation. There are SR-22 documents required for New Jersey drivers who have been convicted of driving without car insurance. You may need to carry these SR-22 documents for up to 3 years. You must also show proof of financial responsibility. You are required to file these documents after your driving privileges have been given back to you. Your insurer will also keep a copy of the SR-22. Good to go insurance can get you the cheapest car insurance prices in NJ. We will help you track down the lowest rates and best discounts, to reward you for your good driving. All you need to do is apply for a free quote online. You can use your smartphone, tablet or any computer. Getting a quote only takes about 5 minutes, and most people can save 40% and even more. Also, we can help you determine which payment options are best for your financial situation. On top of those great discounts, low cost plans are available for the following coverage. The best place to find cheap car insurance in NJ is online. Direct carriers have deals that could save you $500 or more. Start your free no obligation quote and see how easy it is to get lower auto insurance rates in New Jersey.